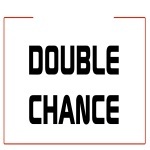 The double chance bet: this bet is ideal to win without taking too much risk. You bet here on two out of three possible outcomes: team A win or draw, team B win or draw, team A win or team B win (1X-12-X2). In fact the staff of Soccerpunt has always analysed the major championships and uses in-depth statistics of each team present in the various schedules so as to compose the best double chance predictions, with high percentage of accuracy, reliable and valid.